The use of a binding to finish the hem, collar or cuff on a fleece sewing project comes in very handy. This technique has been used successfully in factory made outdoor clothing and you can get the same effect at home. Although bindings can be used on any material, stretch binding is most useful with fleece. 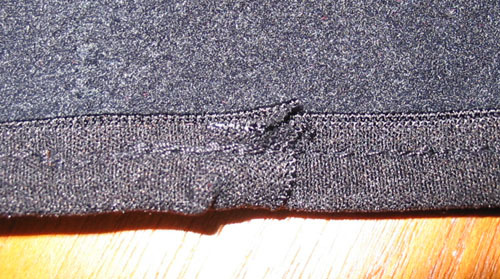 A binding is any narrow fabric used to finish the edge of a larger piece of fabric. Typically bindings are cut on the crossgrain. 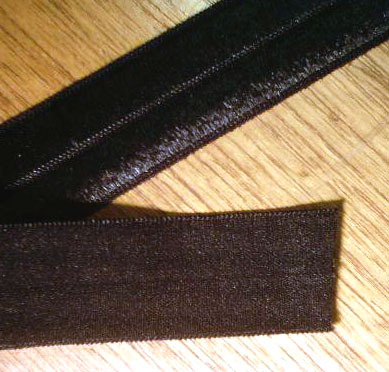 A stretch binding is usually made with lycra and can act as elastic at the same time as finishing the edge. In North America this binding is just Lycra fabric cut in 20-40 mm wide strips. I however prefer a finished stretch binding around 15-30 mm wide. We sell a 19 mm wide stretch binding (SB19) shown below, this has worked very well for us and is identical to that used by, e.g. Häglöfs. Lycra strips are hard to use as you must go through a 2-step process, turning over the edges. With SB19 you can simply sew the binding on once, as the edges are finished already. To attach the binding, start on one end of the edge to be finished, and fold the binding over the edge so that half is below and half above. No need to pre-pin the binding, better to fold as you sew. Using a long straigt stitch, or a stretch stitch, sew 2-3 mm from the finished edge. Stretch the binding as you sew to give an elastic effect, making sure that you catch the underside in the seam. 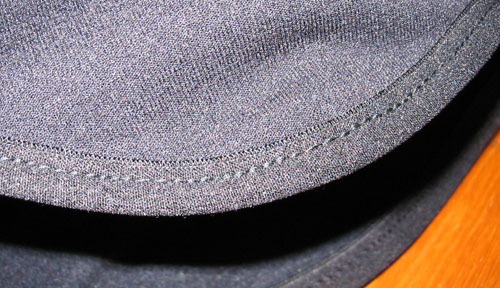 A finished example (the edge of a Powerstretch Tunturi hat) is shown below. If the edge forms a circle, the binding is finished by overlapping the starting point and folding the binding under. Sew and back-stitch over the binding, then cut off the remainder. This gives a nice looking finish as shown below (inside view). Stretch binding can also be used to finish other materials. For instance with mesh it can be used to make an elastic mesh pocket. With nylon it is also used to give an elastic finish to any edge, for instance in a backpack. Even use it to finish the hems and cuffs on for instance a light running/skiing suit.